Tennessee Wing cadet Col. Danny Catino of the Berry Field Composite Squadron was awarded Civil Air Patrol’s highest cadet award — the Gen. Carl A. Spaatz Award (#1521). The award was presented to Colonel Catino by retired Air Force Maj. Gen. Schuyler Bissel during the squadron’s annual awards dinner on March 6. “Through my experience in CAP, I have learned self-discipline, integrity and many other characteristics that have helped me to become a well-rounded individual,” said Colonel Catino, who has been a member of CAP for four years. Catino plans to major in aerospace technology at Middle Tennessee State University where he has been awarded a full Air Force Reserve Officer Training Corps scholarship. He hopes to become a combat rescue officer in the Air Force after graduation. As a cadet, Colonel Catino attended several national special activities, but his strongest interest has been in the field of pararescue training. He graduated from Basic Pararescue Orientation Course, Advanced Pararescue Orientation Course and Mountaineering, where he was taught wilderness survival, mountaineering, land navigation and trauma medical skills by Air Force pararescuemen. “Because of CAP’s national cadet special activities, I discovered the career field I want to pursue and gained the confidence to know that I can do it,” Colonel Catino said. The son of Dave and Gina Catino of Brentwood, Tenn., Danny has lettered in cross country and track for two years at Brentwood High School. As a member of the 2003 Tennessee Wing Drill Team, he assisted his team in placing third in the Southeast Region Drill Team Competition — and plans to be a member of the 2004 team. Some of his many accomplishments include being awarded the Group III 2001 Cadet Non-Commissioned Officer of the Year, Flight 2 Top Performer at the 2003 Cadet Officer School, Bravo Flight commander at National Blue Beret, Berry Field’s 2003 Cadet Officer of the Year and a Commander’s Commendation for squadron leadership. “Cadet Colonel Catino is a fine product of CAP’s cadet program. He is an invaluable leader of the cadets in our squadron and we are extremely proud of this great accomplishment,” stated squadron commander Lt. Col. Claude Fillingham. Colonel Catino is the second Berry Field cadet to receive the Spaatz award in the last four months. 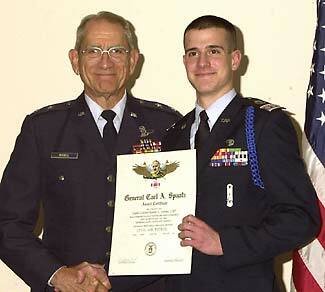 In November, Cadet Col. Chris Perrine received his Spaatz award (#1516). Along with the Spaatz presentation, other awards presented were: Non-Commissioned Officer of the Year — Cadet Senior Master Sgt. Peyton Sweeney; Cadet of the Year — Cadet Lt. Col. Brian Kinner; Cadet Officer of the Year — Colonel Catino; and Senior Member of the Year — 2nd Lt. Hal Snell.